Lone Star Carpet Care and Restoration bets our reputation (and our name) on carpet cleaning, but that isn’t all we do! We’re also experts in tile and grout cleaning. For over 20 year, we’ve been the company that San Antonio residents call to get their tile and grout looking as good as (or better than) NEW! Our clients understand why carpet needs deep cleaning. It’s made of fibers, after all, which absorb moisture and trap small particles within its thick construction. But these same clients would never imagine that their tile and grout could be just as filthy as their carpet. Remember when your grout was brand new and bright white? Now it has a dark brown, even a black color. What do you think causes that? Would you believe it’s caused from dirt, food particles, dander and germs trapped under the surface of the grout? Even harmful mold and mildew can grow within the narrow strips of grout between tiles. The microscopic particles trapped in your grout could be making you, your family or your customers sick! Most people don’t know that, although grout is strong enough to hold tiles in place, it is extremely porous. It allows dust and many other things to settle into these pores, just like carpet does. And your tile probably isn’t as clean as you think, either. Regular mopping and cleaning (and by “regular,” we mean every few days) is your best defense against germs and bacteria on your tile surfaces, but you’ll never be able to penetrate into the deepest layers. Lone Star Carpet Care and Restoration has high-powered, truck-mounted equipment that blasts hot water onto both tile and grout, cleaning and sanitizing them. Along with our acid wash, this method of treatment is the only way to achieve maximum results. A regular mop and store-bought cleaner just can’t do what we can. Although it’s a separate service, Lone Star Carpet Care and Restoration does recommend that you allow us to apply a sealant after we deep clean your tile and grout. This sealant protects the floor from stains, dirt and mildew in the future. Most of us learn to live with the dingy color of our dirty tile. Maybe you don’t even remember what color it’s supposed to be. The added benefit of tile and grout cleaning is that this service restores the bright, spotless look that your tile and grout had when it was brand new! 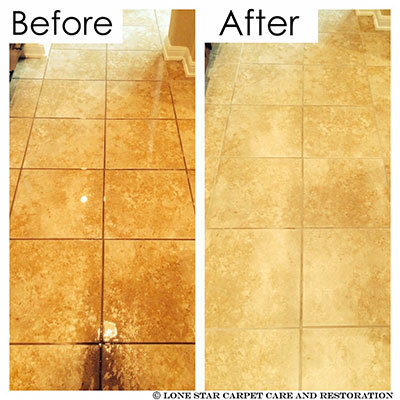 Lone Star Carpet Care and Restoration does tile and grout cleaning for residences and commercial businesses, as well as hotels and guest lodgings. We frequently deep clean the tile and grout in homes. As you can imagine, bathrooms and kitchens are the main rooms that require this service. Offices and hotels also frequently request our services to keep their tile and grout as clean as possible! 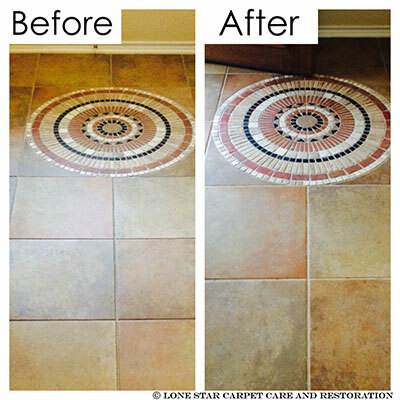 Let Lone Star Carpet Care and Restoration come out and do a thorough tile and grout cleaning in your home or business today!